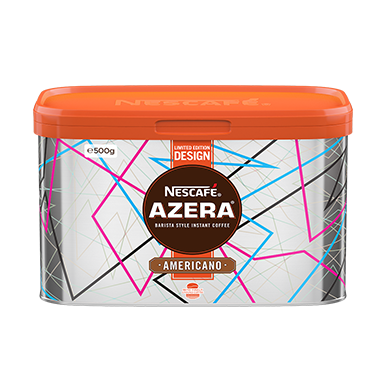 Introducing the very first 500g limited edition tins for the workplace: ‘What Brightens Your Morning?’ and ‘Spark 2.0’ from the Azera By Design range. 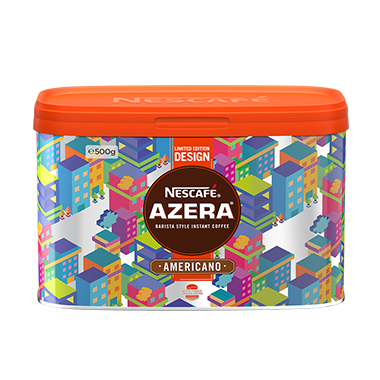 The iconic tin designs were developed by students from the University for the Creative Arts (UCA) in partnership with our NESCAFÉ AZERA brand team. The collaboration put the students and their designs at the heart of the campaign – an opportunity for up-and-coming designers to showcase their talent in a real-world setting. For their creative process, the students took inspiration from the world around them and worked to the theme of positivity. With this new campaign we aim to invigorate the category – elevating its Azera By Design tins to a league of their own: staying relevant to its audience and giving businesses everywhere the choice of bold designs that enliven the workplace. The new 500g limited edition tin designs will be available for four months nationwide.